uPVC Spray Painted Windows. 20% Off uPVC Painting, windows, Door & Conservatory Spraying. 20%} OFF Kitchen Cabinet Spraying. SprayMasters UK is an Elite Onsite Repair & Spray company specialising in uPVC Paint Spraying, Composite Doors, Curtain Walls, Plastics, Metal & timber. Our Services see us travel the lengths of the UK we provide high-quality fine finishing & competitive rates. From Commercial refurbishments to Industrial factories we have a solution for all. Fitout & shopfitting companies often use our onsite & offsite spraying services as we produce high quality finishing along with a good & fair price. 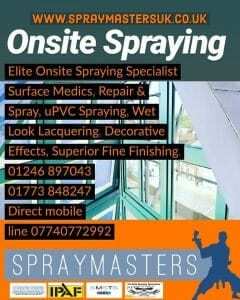 SprayMasters UK is competent & trustworthy we have built a solid reputation for on site spraying. Cladding Spraying, Curtain wall repair & spray, suspended ceilings, lift doors, entrance doors we can spray it all. “Your one-stop solution for onsite spraying works”. Professional Spray Finishing at affordable prices, SprayMasters UK. We have a Good health & Safety record & a real enthusiasm for producing quality finishing. Elite trained spray technicians. We have the knowledge & the experience, SprayMasters UK are veterans in the spraying of uPVC, Kitchen cabinet doors, furniture, on site spraying & bespoke finishing.